Get in it for the dough – the pizza crust we mean! Pizza is a classic favorite, which is why people get a kick out of creating their own personal pies. Luckily, this prosciutto pizza recipe provides a unique alternative to plain pepperoni. Ribbons of Prosciutto di Parma are the perfect décor, don’t you agree? Eggs are also all the craze these days because they are beautiful, healthy and protein-packed. 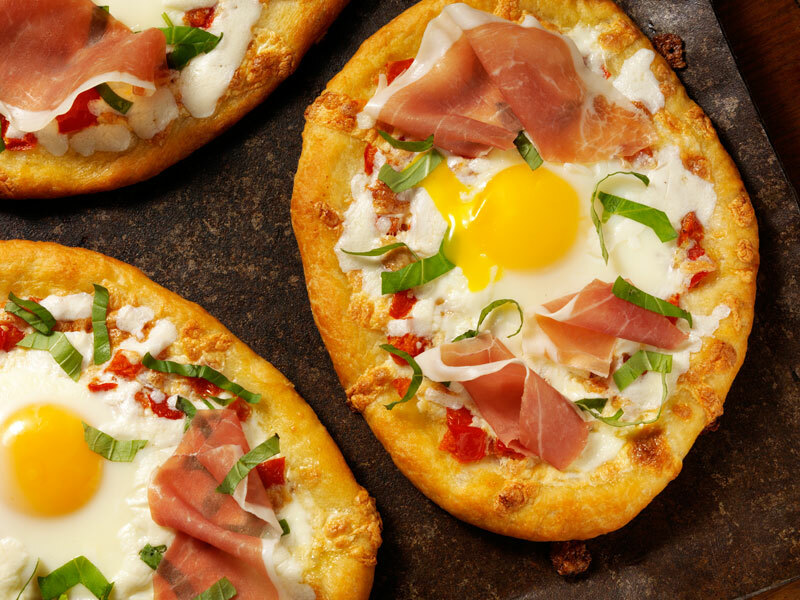 The abundance of textures and colors on this prosciutto pizza will entice everyone. Regardless of how you slice it, this pie is extraordinary! Preheat oven to 500°F. Brush 2 baking sheets with 3 tablespoons of the olive oil, set aside. With a sharp knife, chop tomatoes, sprinkle with 1/4 teaspoon salt, place in a sieve, and drain 5 minutes; discard juice. In a small bowl, mix tomatoes with 1 tablespoon olive oil. Cut pizza dough in 4 pieces. On oiled baking sheets, pat and stretch each one to make an 8-inch round. On each pizza round, spread tomatoes and sprinkle with Mozzarella. Bake until dough is browned and cheese is melted, about 12 minutes. Fill a large shallow saucepan with about 3 inches of water and 1 tablespoon salt, bring to a gentle simmer. Break an egg into a small bowl; place the bowl close to the surface of the simmering water and slide the egg into the water. With a large spoon, nudge the egg white toward the yolk; repeat with the other eggs. Turn off the heat, cover and cook just until the white sets and the yolk is still soft, about 2 minutes. Meanwhile, place each pizza on a dinner plate. Arrange Prosciutto di Parma strips on top; sprinkle with basil ribbons. Remove each egg from water with a slotted spoon and set on top of a pizza; drizzle with olive oil and sprinkle with freshly ground black pepper, if desired.